There are seldom things better than a trip with the family. 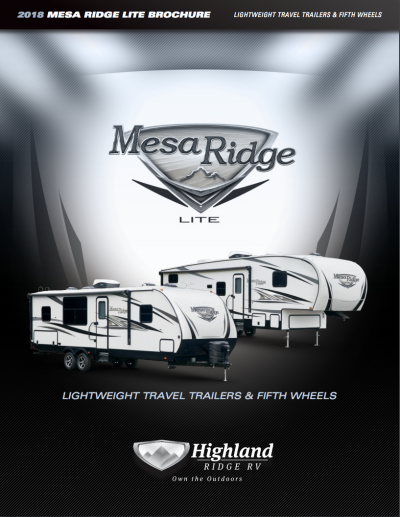 Make those trips even better with the 2018 Highland Ridge Mesa Ridge Lite MR2802BH! This Travel Trailer is the ultimate travel buddy, and it's ready for years of RV adventures! When you shop at National RV Detroit, you can get this model and other top quality RVs for an excellent price! Our ultra low prices and exceptional customer service are just a few of the reasons why we're one of the top RV dealers in Michigan! See this model for yourself when you visit our lot at 44700 N I 94 Service Dr Belleville Michigan 48111. If you're looking for more information, call our Mesa Ridge Lite expert today at 734-439-3400! This rig has a GVWR of 7450 lbs. and a hitch weight of 510 lbs. The exterior features a 20' 0" awning! You want to make sure your family eats healthy, nutritious meals when you're on vacation because you know the importance of a good diet. You'll have no worries in the Highland Ridge Mesa Ridge Lite MR2802BH, thanks to the modern kitchen it features! With its handy 3 burner cooktop and other cooking appliances, you can whip up delicious hot meals morning, noon, and night! 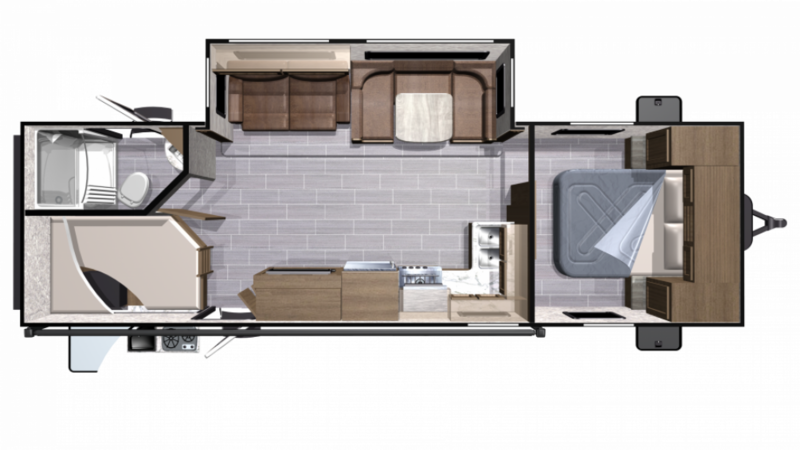 And you'll store all those fresh, healthy foods in the 8.00 cu. ft. refrigerator! You'll be able to clean, drink, and cook with plenty of water from the 51 gallon fresh water tank! In the past, did you miss leisurely, hot showers when you were on the road? Or did you have to make that tedious trek through the campground to the cold, damp, messy community bathroom and then wait in line if you wanted a shower? There's good news for you when you camp in the Highland Ridge Mesa Ridge Lite MR2802BH! It boasts a bathroom with a roomy shower as well as a handy Porcelain Foot Flush toilet! Comfort, convenience, and privacy, with plenty of clean, hot water thanks to the 51 gallon freshwater tank and 60 lbs. of LP tank capacity! Dirty water and waste are stored in the 58 gallon gray water tank and the 29 gallon black water tank, respectively. Everyone sleeps well at night in this cozy RV, especially with the extra snug Bunkbeds in the bunkhouse! You'll love the handy outdoor kitchen, especially when the weather outside is gorgeous! Just open it up and cook all your favorite meals in the fresh air and sunshine!